The share of Latino adults who identify as Catholic is declining as the share of Protestants and the religiously unaffiliated rise. Today, 55% of Latinos say they are Catholic, a drop of 12 percentage points in the last four years, while the share of those who are Protestant and unaffiliated with any religion has risen, according to a Pew Research Center survey of Latino adults. But differences exist among Hispanics when they are looked at by their country of origin: Mexicans and Dominicans are more likely than most other Hispanic origin groups to say they are Catholic. Meanwhile, Salvadorans are more likely to say they are evangelical Protestant than Mexicans, Cubans and Dominicans. Among the nation’s 53 million Hispanics, some 64% are of Mexican origin. The next biggest group, those of Puerto Rican origin, accounts for 9% of Hispanics in the 50 states and the District of Columbia. 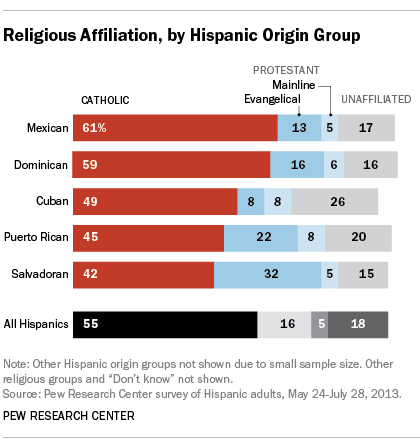 Three other origin groups—Cubans, Salvadorans and Dominicans —each make up at least 3% of Hispanics in the U.S.
About six-in-ten Mexicans (61%) and Dominicans (59%) identify as Catholic, compared with about 49% of Cubans, 45% of Puerto Ricans and 42% of Salvadorans. Some one-third of Salvadorans are evangelical Protestants. The differences between Hispanic origin groups fade when it comes to religious switching—the percentage of those who have left their childhood religion. About one-third of Mexicans (30%), Puerto Ricans (34%), Cubans (33%), Salvadorans (32%) and Dominicans (34%) said they have switched from their childhood religion. About 5% of Hispanics, regardless of origin group, identify as mainline Protestant. But religious affiliations differ between Hispanic immigrants and those born in the U.S. For example, the share of all Hispanic immigrants who are Catholic exceeds the rate among those born in the U.S., by 60% to 48%. Among Mexicans, 68% of immigrants identify as Catholic, compared with 51% of those born in the U.S. Some 24% of Mexicans born in the U.S. said they are religiously unaffiliated, a rate about twice as high as among immigrants.